Before the Rhine was regulated there were many gravelly or sandy islands which were regularly changed by the floods. In the course of the regulation the islands got lost, and the plant and animal species depending on these sites strongly decreased. These measures which were conducted at most of the rivers in Europe led to the fact that many species are meanwhile endangered all over Europe. At the tip of the promontory “Kohlkopf“ which separates the river Rhine from the Illinger Altrhein, a connecting ditch will be excavated between Rhine and Altrhein, at the same time creating a small island on which waterfowls can rest and nest undisturbed. Water will flow into the Illinger Althrein and wash away mud and sand. Fish can spawn over gravel subtrate. On the western shore the bank fixation will be elimated on a 250 Meter long stretech in order to develop a natural embankment. At the “Tomateninseln“ a ditch will be dredged, and the groynes will be altered in order to permanently separate the islands from the embankments. The dredged material will be used on-site to stabilise and elevate the islands. Many fish species spawn in the gravel. This means that they need shallow, gravelly sections undisturbed by ships. In the new channels suitable spawning grounds will be created which can offer protection of the juvenile fish from the wash of the waves of the ships.
" typeof= On the open gravelly and sandy sites the formerly frequent bird species Common Tern and little ringed plover can breed. 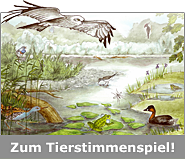 An open question: Will the Common Sandpiper which is supposed to be extinct in Baden-Württemberg resettle here again and accept the sites as breeding habitat?